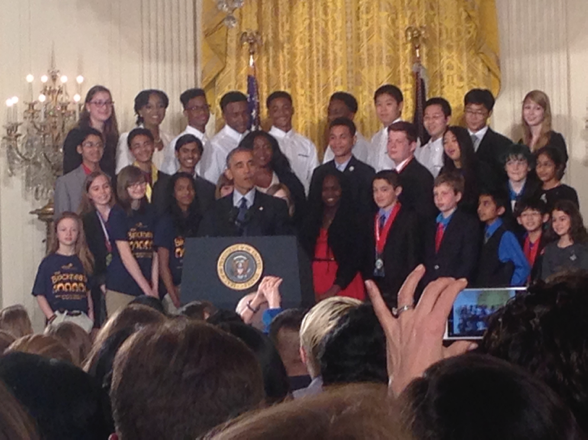 MVGATE was honored to be invited to the sixth White House Science Fair on April 13. The Fair included the Administration’s announcement of program commitments in support of the President’s Computer Science for All initiative – we are thrilled to be working with the White House in support of that program, by helping any elementary school in the country put on one of our most popular programs, Family “Hour of Code” Night. More info on our Event Kit for that program is here; while a profile of our work is here on the White House website, Jump-Starting K-5 Computer Science Education. We'd love to share the experience with our MVGATE community! ​​It was a perfect spring day in the nation’s capital: blue skies, sunny and crisp, just beautiful. Those of us invited to the event lined up outside the 15th Street entrance, went through a few careful levels of White House security, then made our way into the East Wing through the Colonnade and into the Kennedy Garden. There and throughout the first floor of the White House, scores of kids chosen for the Science Fair displayed an amazing lineup of projects. You can view the White House webcast on the kids and their Science Fair projects here. ​The White House invited a range of well-known science and technology celebrities to attend the event: the opening greeting was transmitted live from astronauts in the International Space Station; Bill Nye the Science Guy roamed the crowd; and the ever-gracious Adam Savage of MythBusters fame got down to eye level with a young reporter covering the event. We were particularly pleased to meet Hadi Partovi. Hadi and his brother Ali founded Code.org, whose online curriculum we use in several MV GATE classes. We first met Ali one year ago when he gave the keynote speech at our Family "Hour Of Code" Night here in Marin. In his address the President hailed numerous kids and their amazing projects, from an improved Ebola diagnostic test created by a 9th grader, to a team of girls who sent a GoPro camera to 70,000 feet and the edge of space. The feeling in the room, packed with families, reporters, and computer science educators, was electric. After the President’s address we wandered through the White House first floor, viewing such projects as a Styrofoam recycling breakthrough (you can make it into a useful glue!) against a backdrop of some of the most storied rooms in American history (East Room, Red Room, Blue Room, et al.). ​At last, after hours connecting with great science, coding, and education minds young and old, another terrific White House Science Fair drew to an end. MVGATE looks forward to continuing our work with the White House, and to doing our part to support Computer Science for All.